Replacing a chainring - what did I do wrong? I thought I could figure out repairs myself but clearly I'm a moron. I replaced the chain and chainring on my fixie last Saturday, and this morning it got scary loose on me. I started to feel what felt like slack in the chain, but when I pulled over to check it out I noticed that all five of the bolts on the chainring were halfway to falling out. Starting with an Allen wrench and a screw driver, I started removing the nuts/bolts holding the old chainring in place. Successfully remove three of the five. Glare at rust on threads of nut. Fight with the remaining two bolts, which seem to have seized. Add a small amount of WD-40 to seized bolts. Fight some more. Swear. Attempt to use a hammer to tap on screwdriver to loosen bolts. Lament my lack of a third arm. Swear some more. Take a break. Look accusingly at old chainring. Pretend to do something else, in order to lull it in to a false sense of security. Realize that the only thing I'm doing is stripping the nuts and coming seriously close to accidentally stabbing myself with a screwdriver. Admit defeat, go to LBS. 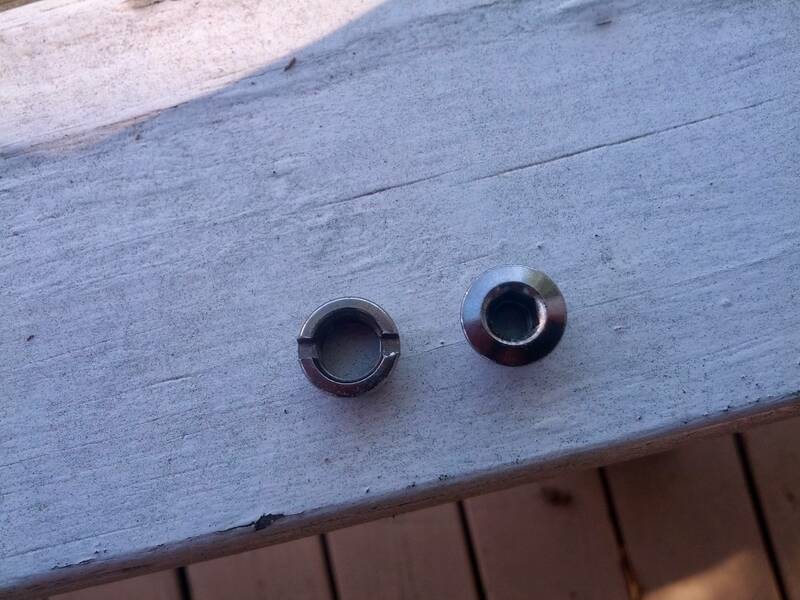 Get a proper chainring nut wrench and a replacement set of chainring nuts/screws. Cackling with the newly found power of using the proper tool, removing the frozen bolts and the old chainring. Ride to/from work, no problems. Ride to work, almost die, s#!t bricks. All told, I rode about 20 miles between installing the new chainring and the extreme loosening that I had this morning. Did I miss some fundamental step in this process, or was this just bad luck? What can I do to keep this from happening in the future? I only removed one of the bolts because I didn't have the time to take the whole thing apart. If necessary, I can disassemble the entire thing when I have time. It says threadLOCKER but it mainly provides thread friction so bolts don't back out of their own accord. RED locktite on the other hand, locks it on there. 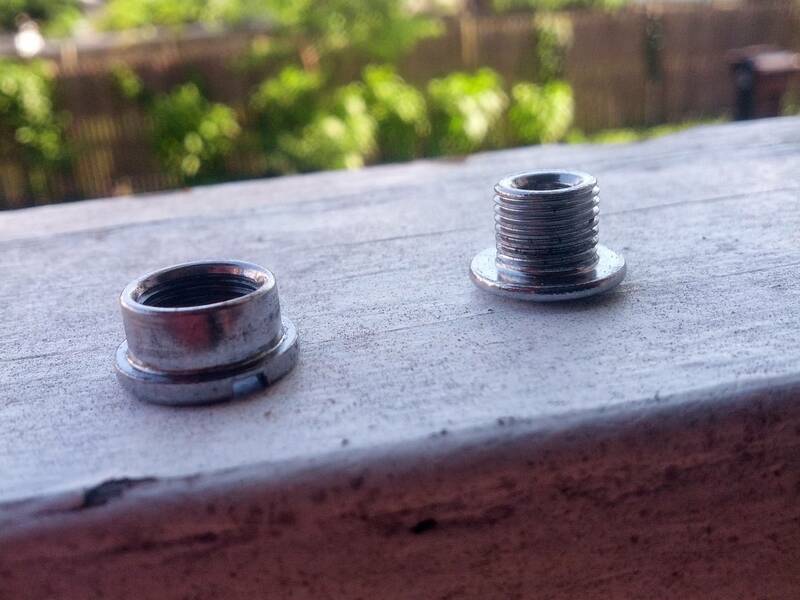 As to why those bolts backed off, some of the steel bolts I've seen have a very low friction coating on them and with the high torque you get with the fixies, well, they can back off. Consider that you should use either grease on the threads of your chainring bolts when installing chainring bolts, you want to be able to easily remove these later as chainrings do need to be replaced over time. 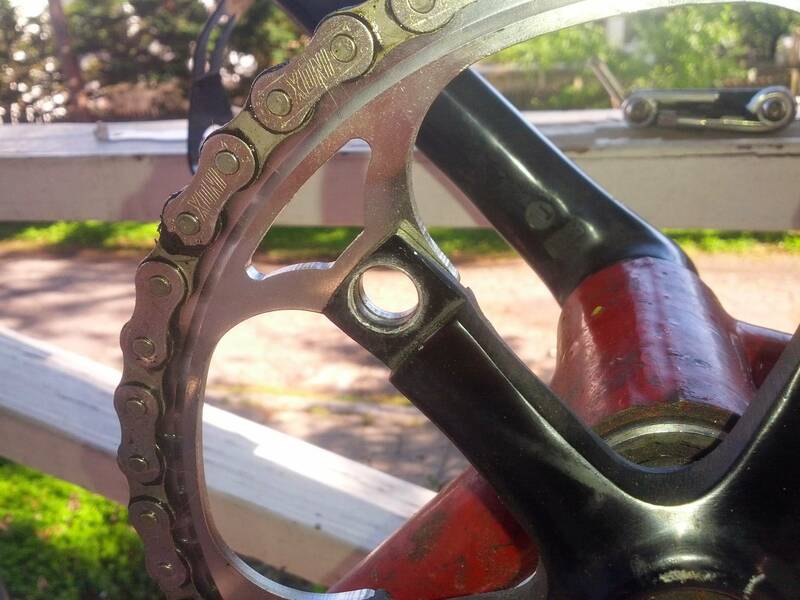 Get some grease on the faces of the chainring and crank spider where they touch the chainring bolts. Some people are fine with blue loc-tite, but I prefer not to have to force it. Don't just tighten them once and assume it's ok. Go around the ring and tighten every other bolt until you've tightened them all. You can do a star pattern if you prefer, just don't tighten them simply in order around the ring. Make a couple passes and incrementally increase tightness. You want to ensure they are tightened evenly, so that none of them are loose while others are over-tightened. Use a torque wrench if you're really worried about over-tighening. 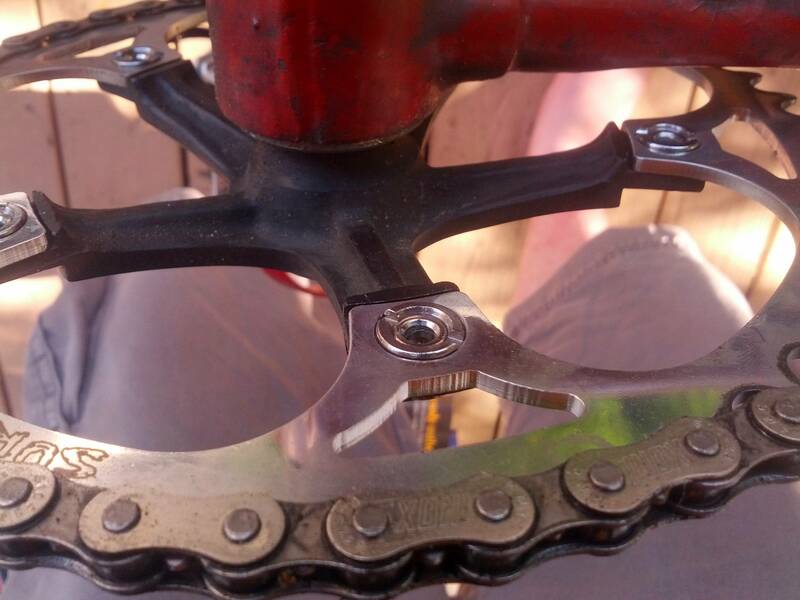 Make sure you're using the appropriate length of chainring bolts (which doesn't seem like a problem from the photos). 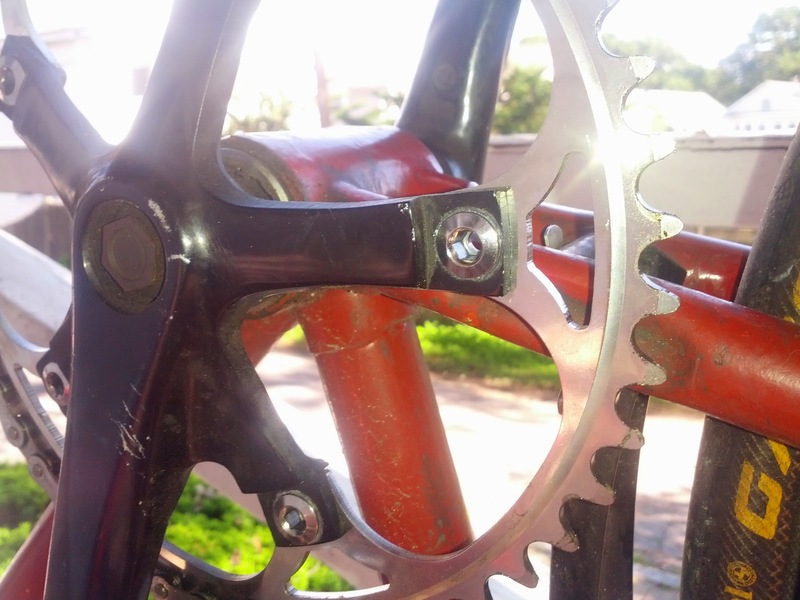 Some bolts (actually the sleeve/nut) are made longer to go through the crank spider and 2 rings (or bash guard), while others are made shorter to go through the crank spider and a single ring. Given the instructions from Surly are grease and not loctite I don't agree that loctite is the answer. Same with instructions from sram. Something is wrong for those to go loose in a day. Are you sure you have 6mm (single)? That bolt looks long relative to the nut to me. I seems like more thread on thread is a good thing. Understand you don't have a TruVativ but only place I found torque. For steel torque is 12-14 nM. And they show the nut on the chainring side (like you have it). Not the answer you're looking for? Browse other questions tagged safety repair chainring or ask your own question. 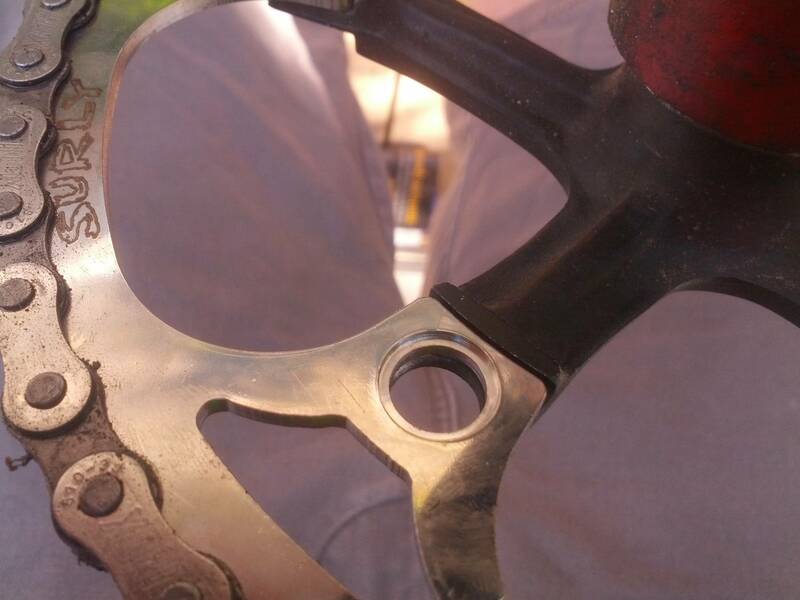 How did this happen to my chainring? How can one remove this chainring? Toothed plastic cup on bottom bracket got sheared off - still removable?